Genius and World War II hero, Alan Turing, is set to be pardoned for his conviction of the Britain's 1885 Criminal Law Amendment Act which prohibits "acts of gross indecency between men, in public or private." He was sentenced to chemical castration which caused impotence and gynecomastia. 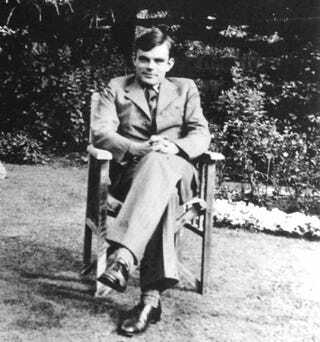 Turing died two years later from cyanide poising. It's believed that he committed suicide by eating a poisoned apple - perhaps re-enacting his favorite scene from Snow White and the Seven Dwarves. Alan Turing's story is heartbreaking. I guess an extremely belated pardon is better than the brush off of "he was convicted for something that was illegal at the time" which he has gotten for years now. Now if we could only get US schools to teach about him in history class. If you are unfamiliar with Alan Turing, I'd suggest this RadioLab from last year.